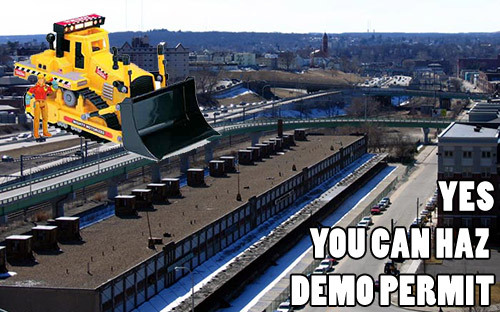 PROVIDENCE – A judge has ruled that Carpionato Properties can knock down the food and produce terminal on Harris Avenue, denying an attempt by state lawyers to stop the demolition. The Johnston developer had obtained a demolition permit last week from the Providence Building Official, allowing them to destroy the building as soon as asbestos removal work is complete. The permitting surprised state officials, who had sold the historic 1929 building to Carpionato in February 2007 with the understanding that it would be reused. The day after the demolition permit was issued, state lawyers filed a motion seeking a temporary restraining order preventing Carpionato from knocking down the building. This afternoon, Superior Court Judge Michael Silverstein denied that motion, saying that the state would be unlikely to prove its case in the long term. “The court has concluded that it is unlikely here”¦ that plaintiff has a reasonable likelihood of success on the merits,” Silverstein said. “The court inescapably has concluded here that it must find against the plaintiff’s position,” Silverstein said. “We will take the canopies off and continue to remove the asbestos,” Coates said. Carpionato’s attorneys speculated that full demolition could take as long as four months. State Lawyer Michael Mitchell declined comment.